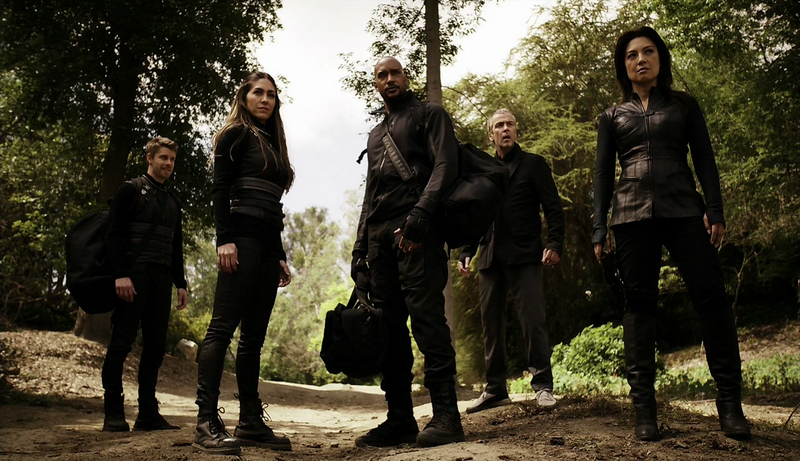 The penultimate episode of the third season of Marvel’s Agents of SHIELD sees the team take the fight to Hive as his plan to unleash his new virus on the world accelerates. ABC chose to air both of these episodes on the same night but they aren’t edited together as they were last season so I’m reviewing this one without seeing the next one so that my opinion isn’t coloured by future knowledge. I’ll try to keep this a bit shorter than usual since the finale will hopefully answer any of my questions. The team had a bit of a victory last week with Daisy being returned free of Hive’s influence as well as the removal of Lash’s potential to be a threat. This episode mostly puts everything in the position it needs to be before the next episode gives the resolution though it doesn’t feel like it’s doing that. I was impressed by how this episode kept everything fairly grounded on the characters and how they felt about the situation rather than the situation itself. 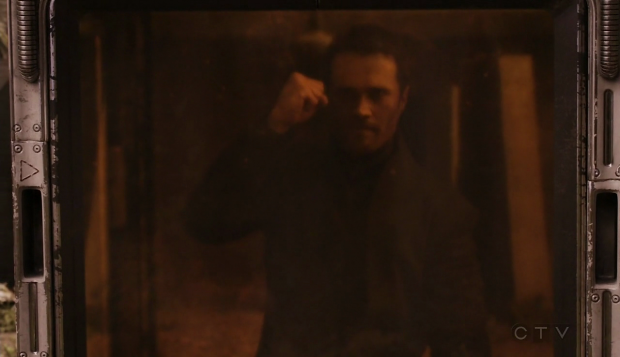 Mack had a lot of the best scenes in that regard as he has had severe trouble with his role in the past few episode. Losing Daisy to Hive really affected him and that hasn’t gone away even though she has returned. Recently he has had trouble keeping faith and Elena has been trying to help him with that. Last week she gave him her crucifix as a reminder that it is possible for him to regain it and that seems to pay off here when he tries to return it to her. She tells him that it’s a symbol of faith rather than being some kind of lucky charm so as far as she’s concerned he has missed the point of the gesture. The whole idea of the crucifix being a symbol of something good is an interesting idea to play with as the knowledge we have of the future turns it into something of a cursed object. We know -or at least strongly suspect- that the last person to hold it will be the one who dies so the episode teases us with who that will be by having it pass from Mack to Yo-Yo and finally end up with Fitz who is wearing a jacket with a S.H.I.E.L.D. symbol on it that seems to close the case on who is dying. I don’t think it will be as simple as that as the show will probably throw in a last minute twist that defies any expectations set by this episode. There is an attempt to strongly hint that it will be Fitz as he has that conversation with Simmons about going away to have a peaceful holiday together when this is all over. Maybe the next episode will follow through with this and have Fitz meet his end but I very much doubt it. The life threatening situation that Fitz found himself in was really capably handled. Having the gas that can turn people into Primatives -formerly Swayed, it didn’t occur to me last week that these are the Marvel Cinematic Universe version of the Alpha Primatives– being that nearby threat kept it tense and the growing numbers of Primatives showed how easily the situation could escalate. The twist of having the frequently mentioned Absolution be the place that the supplies for the S.H.I.E.L.D. base were shopped from was really clever as well. I liked the Trojan Horse idea and wasn’t expecting it to be such a simple yet effective reveal. It was great to see Fitz and Simmons plan to have a dose of normality when Hive has been dealt with because as a couple they haven’t really had that. Their banter about who is more romantic was nicely done and shows the bond these characters have. I also like that their relationship is something that is happening in the background without making it the primary focus. As long-time readers know I’m fed up of relationship drama but don’t mind it when it’s organic like this. Daisy is having problems resolving what she did when under Hive’s control. The whole addiction angle is referenced again when Coulson tells her that she is going through withdrawal so all of the feelings she is having can be associated with that. She feels responsible for everything she did as she vividly remembers doing those things but doesn’t want to be absolved from her guilt. 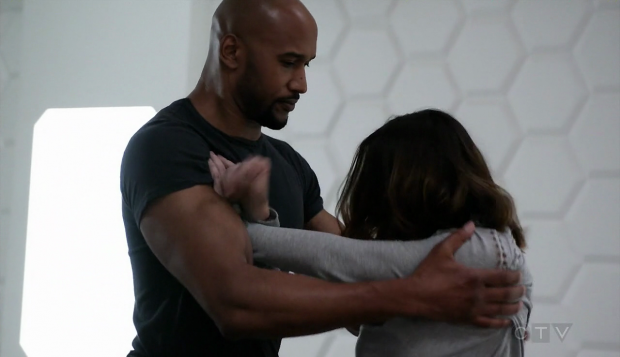 Coulson goes through the usual talk of it not being her fault as she was made to do those things but as far as Daisy is concerned the responsibility lies with her. The guilt she feels also extends to the fact that Hive knows everything about the team because of what she freely told him. This eventually culminates in a really touching scene with Mack where she is forced to let all of her emotions out. Mack represents the awful things she since she almost killed him so it makes dramatic sense that he be the one to help her deal with it. Having his forgiveness helps her start to forgive herself. At least it seems to be going that way until she begs Hive to take her back. I’m unsure if this is a red herring to allow her to get close to him and take him on or if she genuinely wants to feel the inner peace he gave her before. Looking at it from an addiction point of view it completely makes sense that she would relapse so it’s an effective cliffhanger. Lincoln’s encounter with Hive feeds into the idea of Daisy lacking a sense of belonging. He really manages to get inside Lincoln’s head by telling him that he can’t give Daisy what she needs so has no real use in her life. 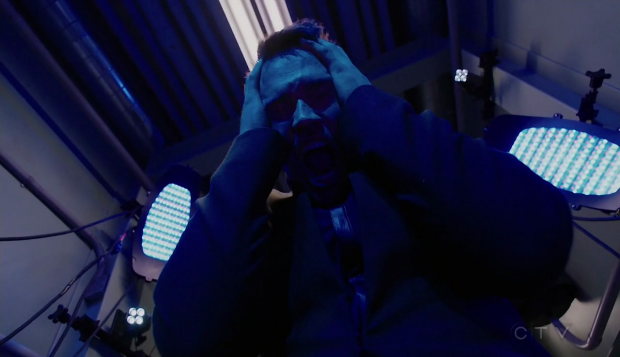 This really gets to him and he tells Coulson that S.H.I.E.L.D. isn’t for him because Daisy needs something he can’t provide. This had all the fixing of something that should have been interesting but Lincoln is so bland that it basically feels like filling time. Having it add another layer to the Hive/Daisy dynamic works well though. Making Hive relive the memories of all the people he has consumed was a great idea in bringing him down. He has all of those personalities and memories swimming around inside of him but up until now he has been the one in control. Using the memory machine to disrupt that control was a really nice touch and allowed Brett Dalton a chance to play Hive in a more vulnerable place. The way he switches from Ward to Will to Malick’s brother while his followers looked on confused was great and it allowed the team the upper hand they needed to finally capture him. Of course the capture just gets him closer to his goal but as ideas go it’s a really good one. He also still seems disoriented as the episode ends so hopefully this will continue in the next one. A great episode that sets things up nicely for the finale. Daisy’s guilt combined with her withdrawal symptoms worked really well but Coulson’s platitudes about it not being her fault felt a little typical. Lincoln’s decision to leave after this is over ties into Daisy’s feelings but falls somewhat flat because Lincoln is so poorly developed. Mack was the strongest presence in the episode as his crisis of faith is still playing on him and the use of the crucifix as a symbol of that faith with it actually acting as a cursed object was a nice touch. Fitz and Simmons are also handled really well with their plans to have a break from all of this once it’s over developing their relationship organically. The cliffhanger of Daisy wanting Hive to take her back makes dramatic sense when it comes to an addiction story as well as ending the episode on a tense note.